Located in Vaughan, Ontario (about 20 mins north of downtown Toronto on a good traffic day) is Canada's largest theme park, Canada's Wonderland. The park has over 65 rides, 16 of those being high thrill, pure adrenaline roller coasters. Interestingly enough, Canada's Wonderland is ranked second in the world by number of roller coasters, beneath Six Flags Magic Mountain and tied with Cedar Point; go Canada! Flight Deck at Canada's Wonderland. Photo Credit: This file is licensed under the Creative Commons Attribution-Share Alike 2.0 Generic license. For the majority of my childhood/teen years the park was owned and operated by Paramount...yes, the movie company. The rides were named after movies, like Top Gun, Italian Job, Tomb Raider and the kid's zone, Hanna Barbera Land with tons of references to the cartoon characters of that world. When Cedar Fair took over as the owner/operator many of the ride names changed due to legal rights, but us old timers still call Flight Deck, Top Gun, Backlot Stunt Coaster, Italian Job and the Drop Tower, Drop Zone. Very similar to how we treat the Rogers Centre, we still call it Skydome! 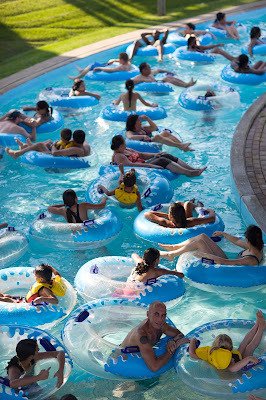 Canada's Wonderland also offers an escape to the hot days of summer with it's Splash Works water amusement center. Here you can relax on a lazy river, induldge in more thrills on water slides, catch a wave in the wave pool or simply soak up some sun in the lounge areas. One of the unique and probably coolest things the park offers is the Halloween Haunt (formerly known as Fearfest). On weekends in October the park opens at 7:00pm and is transformed to scare its guests with live shows, horror mazes, scare zones and of course big thrills on the rides in the dark of night. It's actually quite entertaining, especially if you have friends that scare easy. Quick Tip: If you go, invest in the Fast Pass Plus ticket. You can basically skip the lines on pretty much all the rides. I was able to ride Drop Zone and Leviathan twice within 10 minutes while others waited up to an hour to ride Leviathan once.